We have Just Sold out of Nerf Modulus IonFire Blaster. Not to Worry! Fill in the Notify me When Available and you will be the first in line for our restock of Nerf Modulus IonFire Blaster !! 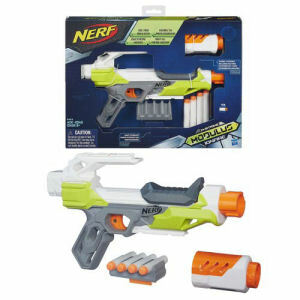 From the Nerf Modulus collection by Hasbro. Nerf Modulus IonFire Blaster. Includes four darts - barrel extension- mountable dart storage. Measures 11 3/4 inches long. Ages 8 and up. Hasbro Nerf Toys shipping from Canada. No Surprise Border fees or Customs!